Many Australians are unaware of the contribution that Aboriginal and Torres Strait Islander people made serving their country. Thankfully this once forgotten chapter of the ANZAC story is being uncovered, shared and told by family members. New media and technologies such as VR, film, books, apps and websites provide exciting opportunities to bring these stories to life, and an ongoing opportunity for all Australians to learn about our shared history. This Anzac Day, take some time to discover these untold stories and remember our forgotten Indigenous service men and women. Here is a list of links to get you started. Know any others? Please add them to the comments so we can share. 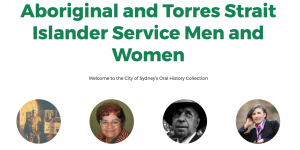 Oral History – Listen to recordings of Indigenous men and women as they share their stories, part of the City of Sydney’s oral history of Aboriginal and Torres Strait Islander service men and women. You can listen to the recordings here. 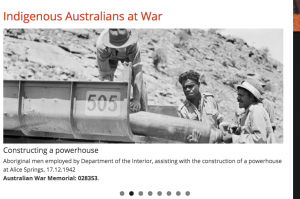 Virtual Library – Since 2008 AIATSIS have hosted Garth O’Connell’s ground-breaking and popular website, Indigenous Australians at War. The now updated and expanded online collection on Indigenous Australian war service includes information to assist family members researching their family military history, a section on Women and War and other interesting links including an honour roll. You can view the full collection here. 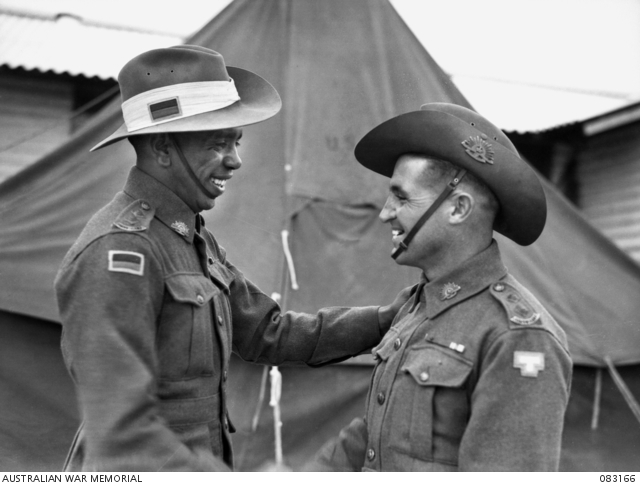 Multimedia Exhibitions – Explore the National Archives of Australia’s multimedia exhibitions that seek to shed light on the experience of Indigenous Australians at war. Indigenous Australians at war: from the Boer War to the present and Facing Two Fronts: The Fight For Respect is a digital representation of Indigenous soldiers and their fight for justice as told by their family members. The Australian War Memorial’s For Country For Nation exhibition shares Australia’s first peoples long standing tradition of fighting for Country. E-books and Documentaries – They Served With Honour is an e-book that shares the untold stories of WA Aboriginal Servicemen at Gallipoli. You can view the book here. 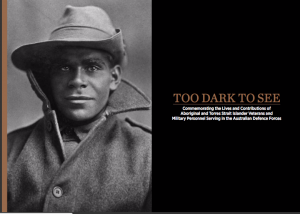 Too Dark to See is a documentary and e-book to commemorate the lives and contributions of Indigenous veterans and military personnel serving in the Australian Defence Forces. You can view the e-book here. Apps – ‘Yininmadyemi’ Thou didst let fall was created by Aboriginal artist Tony Albert. The sculpture stands in Hyde Park to honour the sacrifices and bravery of Aboriginal and Torres Strait Islander service men and women. You can download the City of Sydney Culture Walks app to hear the story behind the artwork here. Social Media –Today Indigenous veterans will lead the national Anzac Day march for the first time. Follow the updates, share your story and read about others using the hashtag #BlackDiggers. You can also follow NITV for live updates here. Nominate an individual or organisation using technology to tell stories and share culture for the 2017 National IDX Awards. Nominations close this Saturday 29 April 2017. Make a nomination here. IMAGE: Lt R. W. Saunders and Lt T. C. Derrick congratulate each other following their graduation from officer training school, Seymour, Victoria, November 1944.